I'm a big fan of the Travel Channel television show Man v. Food with Adam Richman. Man v. Food recently featured Joe's Stone Crab in Miami, a restaurant I'll be visiting for the first time in March of 2011. Have a look at this fantastic picture of Adam with stone crab claws at Joe's. I have had stone crab several times, mostly when I stay with my Uncle Rand, if I can convince him to wake up in time to get us some stone crab claws from the West Palm Beach GreenMarket. It should be an easy task given Rand lives on Palm Harbor Marina across the street from the farmers market but given we frequent Echo in Palm Beach and always eat and drink way too much, it's never easy to be up early the next morning! - Adam took a tour of an oyster hatchery at Frank M. Flowers and Sons, Inc in Long Island. Have a look at the video tour. - He enjoyed "fresh seafood and hospitality in New Orleans, and shares his fears about the upcoming oyster challenge." See the video here. 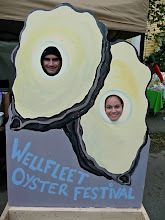 - Adam challenged himself to eat 15 dozen oysters. Watch the video to see if he won the challenge. Would you be able to eat 15 dozen? I don't think I could but I'd be willing to try. - For more on oyster featured on Man v. Food, visit the Travel Channel website. I just did the 15 dozen in 28 minutes at Acme. Talk about a zinc high. I literally felt buzzed. Just found this site a few weeks ago and am looking forward to going back and reading all the posts. Thanks SF Oyster Nerd. Glad you found us. 15 dozen in 28 minutes, WOW!